How To Prevent Major Injury in a Motorcycle Accident Orlando! Many Orlando residents enjoy riding a motorcycle regularly. Some benefit from the convenience associated with maneuvering a motorcycle through traffic or the affordability of this transportation method, and they use a motorcycle as their primary method of transportation. Others enjoy the thrill of a fun weekend ride with family or friends, and they only casually use their bike. Regardless of how frequently you use your motorcycle, you may understand the inherent risk associated with this form of travel. Many motorcyclists are seriously injured or worse on the roads each year, and the last thing you want is to become a statistic. There are a few steps that you can take to reduce your risk of being in a motorcycle accident Orlando. Not all accidents can be avoided, but many can. Reckless driving is unfortunately, common, and it can lead to a serious motorcycle accident Orlando. 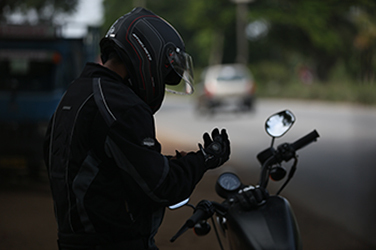 As a motorcyclist, you should avoid risky driving behaviors, such as driving on the shoulder in heavy traffic. You should also be aware that you are much smaller on the road than a car. It can be difficult for drivers to see you in some instances. Avoid driving in their blind spots and coming up quickly behind them. It may also be helpful to take a defensive driving course designed specifically for motorcyclists. All drivers are at an increased risk of being in an accident when driving conditions are poor. This includes when it is raining or foggy. It also includes driving at night. If possible, avoid driving in such situations. If you have an alternative method of transportation, use your car or truck in these situations. You can also use a ride-sharing service to stay safer in these instances. When you do ride your motorcycle, always ensure that you are wearing proper safety gear. This includes a helmet, a riding jacket, pants and close-toed shoes. There is a fair chance that you may be involved in a motorcycle accident Orlando, and this gear can prevent very serious injury or even death in some instances. A serious motorcycle accident can result in damage to your bike, expensive medical bills and loss of wages when you need to take time off of work to recuperate. Payer Law Group can assist you with filing a personal injury lawsuit against the other party in the event they caused the accident. If you caused the accident, you may be sued for damages. Payer Law Group can represent your interests and defend you in this situation. Motorcycle accidents are unfortunately common, and you may be at high risk of being involved in an accident each time you get on your bike. Investing in a good motorcycle insurance policy can help you to pay for some of your accident-related expenses. However, additional compensation may be available, or you may be facing additional liability expenses if you caused an accident. Many accidents turn into legal issues, and you can learn more about your rights after an accident by contacting Payer Law Group today. Motorcycle Laws: What Should I Know Before Buying One?